When Sebastian was first eating "solid foods" all his favorites were orange. He realized this as well and started to look at the spoon as it came towards his mouth to check and make sure we were not trying to slip another color past him. He loved carrots, sweet potatoes and winter squash as well as the combination purees that included any of these foods. The only orange baby food he did not like was apricots. However I continued to buy him apricots, feeding him sample bites of every new jar. Every jar of apricots I would open he would take a small taste make a face and demand a different orange food. Once Sebastian refused apricots again I would gleefully take the jar for myself. You didn't think I was buying all those jars because I was committed to him loving him apricots did you? You see I had discovered the first time he rejected the apricot puree that it was delicious, especially delicious in fact when spread on a slice of challah french toast. It was tart and sweet and balanced the eggy richness of the french toast. 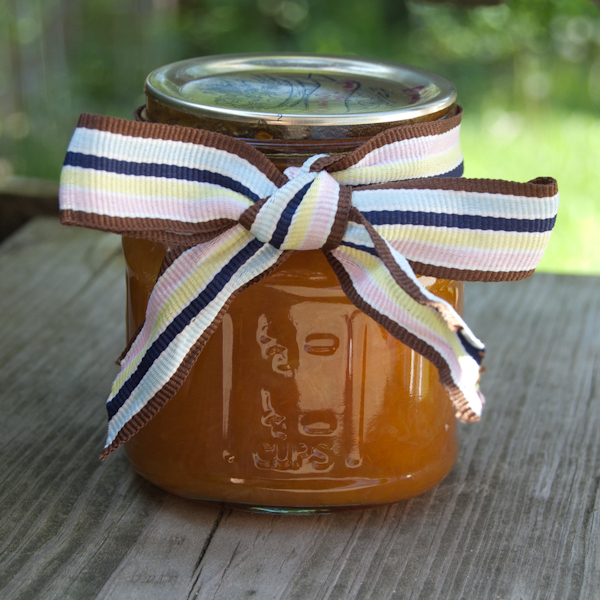 Last week I created a new jam and it is just as good as the apricot puree was, actually it is even better. I combined dried California apricots with rhubarb from my garden. The rhubarb added a bright tartness, helping to make the apricot flavor more true. Some jams are mostly sweet, this one tastes of ripe fruit. Since first making it this jam has become the whole families favorite. The day after I made it I was compelled to bake challah so I could make french toast for breakfast. We all agreed it was perfect, a flavor combination we would not grow tired of, (after trying apricot puree so often as a baby Sebastian now loves apricots). As the jam maker in my family for me it is truly perfect because of how easy it is to make. The rhubarb macerates overnight in the fridge with sugar and lemon juice while the chopped dried apricots soak in water. The next day (or night as I prefer to make jam when my boys are sleeping), The apricots and any remaining water are combined, brought up to a boil and then you immersion blend them. "Immersion blend" is Julian's verb for pureeing something using an immersion blender. After immersion blending the hot mixture it is now ready to ladle into jars. 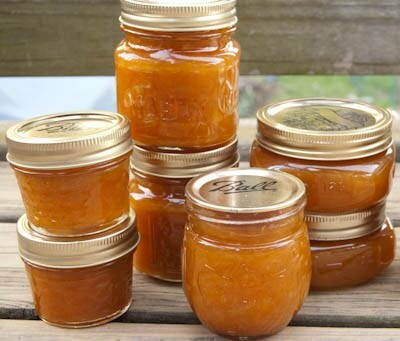 The apricots do not fully hydrate when soaking so it becomes jam right away, no need to spend hours over a boiling pot worrying about whether you will have jam or syrup when you are done. Although I don't understand the problem if you accidentally make syrup. Fruit syrup can be drizzled on ice cream, waffles, pancakes, cake or really anywhere. Chop the rhubarb and place in a non reactive pot large enough to make the jam in or a non reactive bowl. Add the sugar and lemon juice and mix well. Cover with pot lid or saran wrap and place in the fridge to allow the rhubarb to macerate at least overnight, I let mine sit 24 hours. Chop the dried apricots and place in a non reactive bowl with the 2 cups of water, cover with saran wrap and soak in the fridge as long as the rhubarb macerates. Begin the next day by prepping your jars, lids and rings and heating the jars in your water bath canner. You can also just freeze the jam or seal by putting the hot jam in a jar and sealing. There is no risk of botulism with this jam as it is high in acid, however if you do not water bath can it there is a risk that it will mold and you will lose some of your work. I know I would hate to lose my jam mid winter so I use the water bath canning method. Add the apricot and any remaining liquid in the bowl to the rhubarb in a preserving pan and bring to a boil. Once the jam comes up to a boil immersion blend the mixture until it is the consistency you want (I left some whole pieces of rhubarb and apricot in mine). If you do not have an immersion blender you can use a food processor or blender, just take care when pureeing the hot jam. Ladle the hot jam into hot jars leaving 1/4 inch headspace, wipe the jar lids with a damp cloth or paper towel and place on the lids and rings until fingertip tight. Place the filled jars in a boiling water bath canner filled with water at around 180°, make sure the water covers the jars by at least 1 to 2 inches. Place the canner cover on and heat on high until the water comes to a vigorous boil. Once boiling vigorously set the timer for 10 minutes for unsterilized jars and 5 for sterilized (to sterilize jars place in a boiling water bath canner with the water boiling for 10 minutes). The canner must remain covered for the entire time it is being processed, the heat can be lowered as long as the water in the canner continues to be at a full boil for the entire processing time. Once the process time is complete turn off the heat, remove the lid and allow to cool for 5 minutes before removing the jars. Remove the jars using a jar lifter to a counter that has a clean towel, cooling rack or receiving blanket placed on it. Make sure there is at least 1 inch between all the jars while cooling.